Our first trail of the season—where we bust out our boots and walk off the cobwebs after the winter doldrums—is out along a stretch of the Pacific Crest Trail east of the Cedar Springs Dam at Lake Silverwood. It's transitional in nature, sitting on the edge of the foothills between the mountains and the desert: a carpet of dense chaparral with Manzanita, Scrub Oaks, Wild Lilac, Sage, and Rabbit Brush. In the folds where water runs off the ridges, you'll find Sycamore, Willows, Currant, and (yikes!) Poison Oak. It's a gentle undulating path that snakes you in and out—to the inside curve and then the outside curve of the knuckle-ridges that run along one side of a green valley sprinkled with cattle. In the cool temperatures of early spring, the trail is fringed with tender green plants and wildflowers of astonishing variety—one of the reasons we return again and again. Every hike is a new discovery of colorful blooms: Chia, Penstemon, Larkspur, Indian Paintbrush, and others. But by early summer, the area is as hot as the face of the sun—with only dry brown stalks remaining from the evanescent flowers of spring. We chanced upon this Penstemon, which was unlike any we'd seen before on our travels, and we encountered a handful of them along the trail. Though there weren't many, each one a lovely surprise—and so delicate they seemed oddly out of place. Later, at home, Clint looked it up and discovered it is the Showy Penstemon (Penstemon spectabilis)—so very aptly named! When I recently came across my new canvases—the cabinet doors—I knew I needed to set aside a taller one to capture the image of this splendid specimen. We shouldered our packs in the dark. Headlamps in place, we set out on the steep trail rising from the canyon cradling La Verkin Creek. I'd never hiked in the dark before. My head down, with intense focus, I plodded up the trail. When we hike, we have a running joke when someone stumbles: "We're not carrying you out of here, so you better be careful". I always laugh, but meanwhile my stomach does flip-flops and I mind my steps ever so carefully. The morning was cool—in the high 30s—yet with the effort of climbing it wasn't long before we stopped to peel off a layer or two of clothing. By the time we reached the top, it was light enough to see, but the sun hadn't risen over the walls that lined the valley ahead of us. We hiked in deep cobalt shadows while the sky grew brighter and bluer. Then, ahead of us, the sun began to hit the east-facing wall—bursting into a blazing coral, then orange, the folds and shadows shifting to purple. 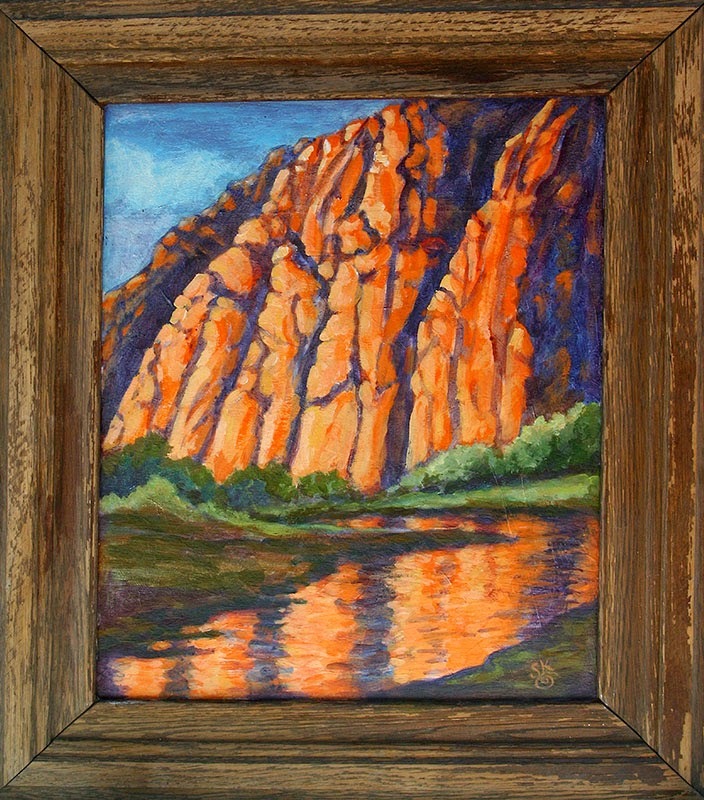 We were still in the lee of a jutting ridge, yet the fiery reflection reached back to where we crossed the meandering creek. It lit our hearts with its brilliance. We paused and watched the show as the sun fully crested the ridge, and then stepped into the full light of the new day. An artist friend of ours is planning to escape Looneyfornia and head north to Oregon. One day as she winnowed through her amassed possessions in preparation for the move, she called and offered me some old cabinet doors she found in the trash. Huh? Sweet Jean, artistic through and through, always marches to her very own creative drummer. She'd come across these old cast offs and decided they would make good painting surfaces—since the construction made them a perfect pre-framed "canvas". I had to go over and check them out. There were all shapes and sizes of doors in the pile, which had sat out in the sun for a few years, rendering the doors even more interesting than when she'd first carted them home. 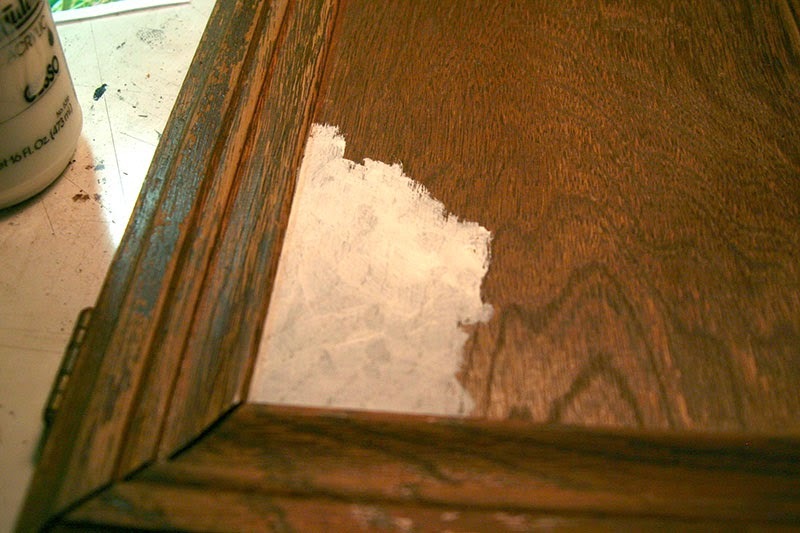 The finish was worn off in most places, leaving a rustic surface that I fell in love with. 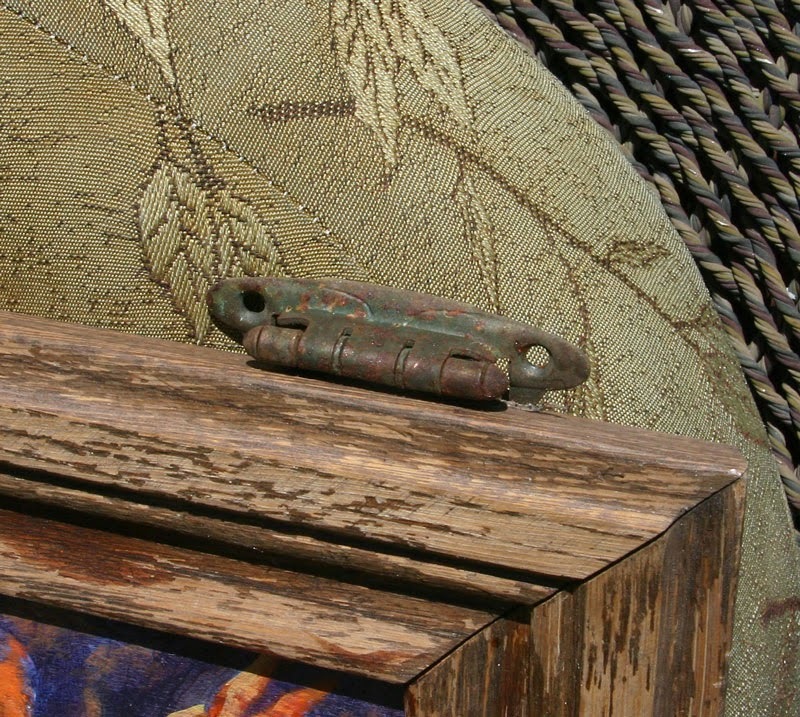 The hinges, still attached and speckled with rust, added to the charm. I was already imagining what I would paint on them. I loaded the doors into the car, plotting as to how to sneak them into the house to avoid the "I thought we were getting rid of junk" lecture from Clint. I couldn't wait to get one up to my studio and get to painting. There was a little bit of prep work involved. First, I had to wash off the spider webs and dirt and let the doors dry thoroughly. Luckily with our super low humidity, this didn't take long. I then slathered two layers of gesso on the center panels to seal the wood and give me a good binding surface for the acrylic. 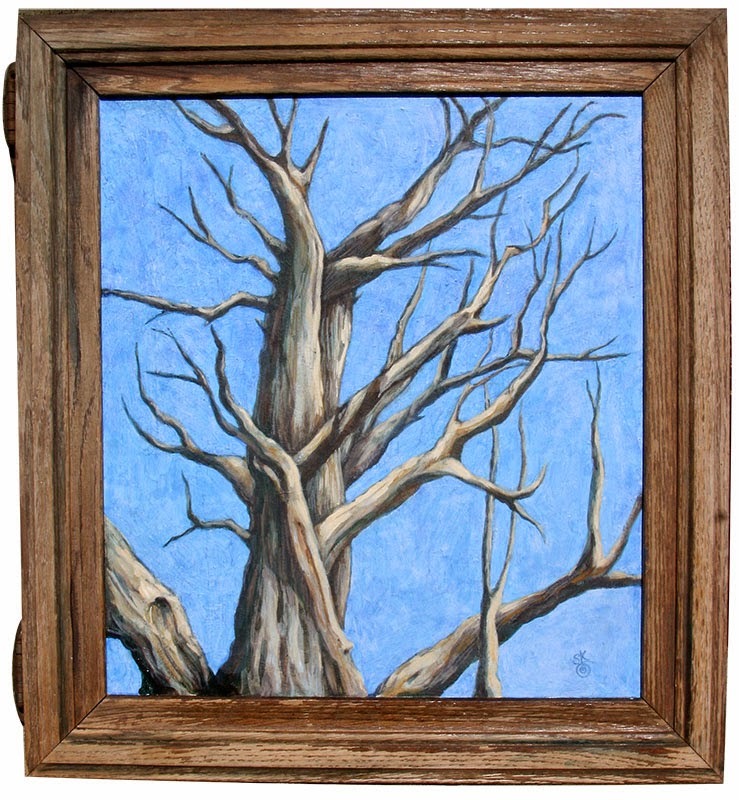 Gesso on wood is a smooth, almost slippery, yet chalky foundation that yields a completely different painting experience. A hint of the wood grain comes through, adding another interesting element to the surface. Sometimes the excitement of a painting is found in the surprises generated by new materials and textures. It was highly stimulating—I've already started on my third "door" painting. I'd climbed up the hill to say hello to the La Plata Mountains, gleaming off in the distance. As I skittered back down, there at the base of the ridge I saw the weathered bones of Grandfather Tree—a perfect guardian standing stark against the big bowl of the Colorado sky. 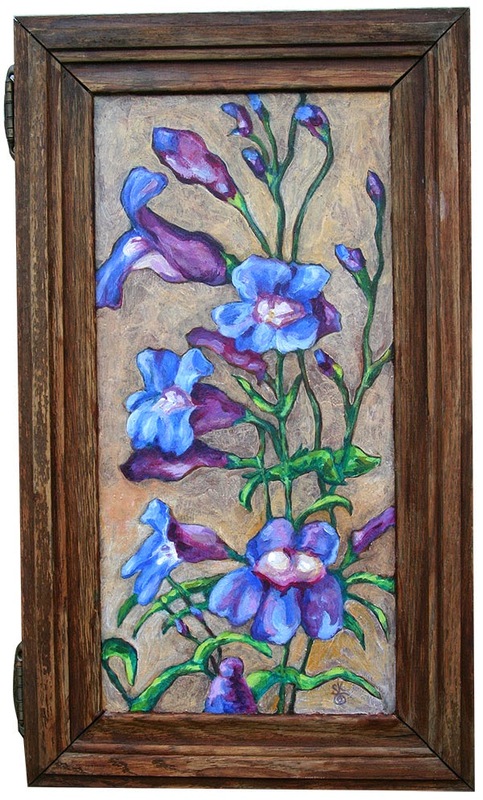 As soon as I saw the cabinet doors, I knew I wanted to paint this image on one of them. Stay tuned for the next painting, coming very soon!